LAST Thursday residents in Ardglass young and old were given a unique opportunity to have their say about the future of the village. With funding support received under the Village Renewal Measure, which is being part funded under Axis 3 and 4 of the Northern Ireland Rural Development Programme 2007-2013 by the European Union and the Department of Agriculture and Rural Development, and with support from the NI Housing Executive, the Ardglass Residents Group ran a Planning for Real day from 2-9pm in St Nicholas’ Primary School. The group has also been assisted by the County Down Rural Community Network. 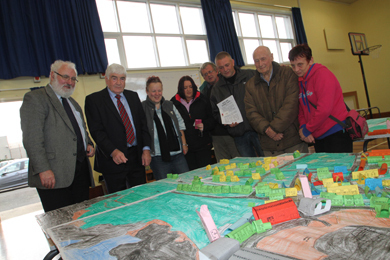 Mentor Consultant Frank Dolaghan and Cllr Dermot Curran, left, with local residents from Ardglass during the community consultation in St Nicholas’ Primary School. Lizzie Walsh, Chairperson of the Residents Group, said: “We received funding to enable us to employ the consultancy firm Mentor Economic Developments Ltd to help us prepare a new development plan for the village. We chose Mentor because they use a very innovative community consultation tool called Planning for Real. “In recent weeks the consultants have been working with school children from St Nicholas’ Primary School to build a large three dimensional model of the village and we would like to thank school principal Mr Fitzsimons and the boys and girls for all their help. The model went on public display in the school on Thursday 24 October. 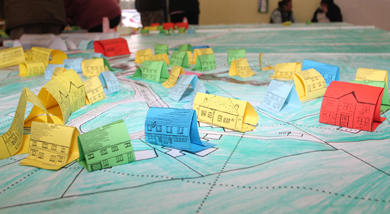 “Local residents were invited to come in and view the model and browse through the 400 different idea cards available covering everything from education to traffic, and from health to crime and safety, and environment to community safety. They could then fill in sheets and include their views and ideas. Margaret Ritchie, Member of Parliament for South Down, has welcomed the consultation event on the Ardglass Village Plan, which took place last Thursday. Ms Ritchie said: “I was pleased to attend this important event for the future of Ardglass development. Planning for Real in Ardglass. “Local people supported the consultation and invested considerable time in putting their ideas forward on a wide spectrum, including future areas for recreation and trying to ensure the impact of anti-social behaviour is mitigated. “I have no doubt, with the community support for this project, it will harness the unique heritage of the fishing village of Ardglass for future generations. Councillor Dermot Curran added: “I welcome the opportunity for the village to consult on the new village plan. I have given this project my full support and look forward to working with the community group to turn the ideas from the consultation event into fruition. 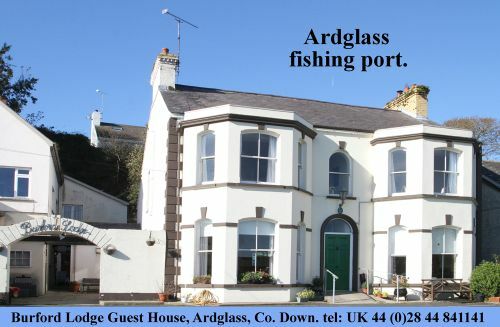 “Ardglass needs quite a number of new ideas developed to ensure it has a positive future. This is about jobs and investment and presents a great opportunity. For example, the village needs workspace units for businesses to grow. We also need a hotel in Ardglass to faciltate our golfing and general visitors and tourists.